Dutch producer Fre4knc has the tactical advantage of being based in Groningen, Netherlands, the same town where Noisia have their studios and record label imprints, including Invisible but it sounds like he likes to keep his work separate. His new Chapter 4 EP out on Invisible next Friday, March 29 is the first full EP he’s ever put out on any of Noisia’s labels, and in fact his work predates Noisia. Known as one of drum & bass’s most diverse producers, Fre4knc has produced on almost every major label from Shogun to Critical and Blackout. When one listens to this fantastic new EP, however, it becomes clear that Invisible was the perfect place for Fre4knc to release Chapter 4, no matter how it came to be. Invisible or no Invisible, this EP is poised to change the both the way drum & bass is produced and the way it’s listened to. It’s hard to put a finger on it as a listener, but there is something very different and spine-tinglingly haunting about Chapter 4, and it truly represents a new technical era in DnB. 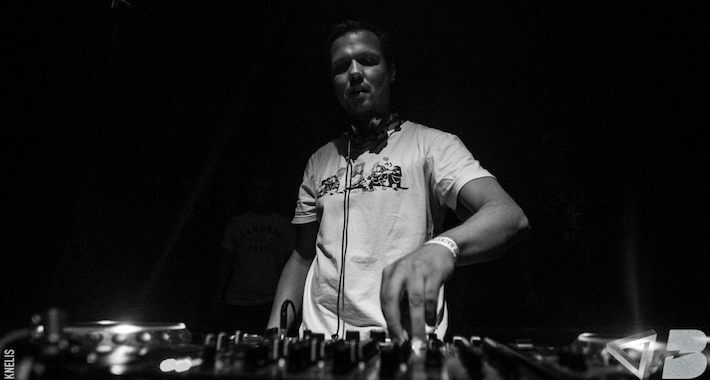 Fre4knc says his personal journey to get to this chapter was also largely technical, as he made a huge change in production programs and then spent months developing new techniques and methods to create the sounds he wanted. It’s great when software innovations catch up with the sounds kicking around in producers’ heads, and even better when someone like Fre4knc takes the reins and rides that innovation all the way to an epic EP like Chapter 4. For tech heads, Fre4knc has answered a lot of questions in this interview but doubtless raised even more. Either way, the vibes on this EP are superbly clean, dark, beautiful and haunting all at once. Chapter 4 releases on Invisible on March 29. Check Beatport and SoundCloud on the release date for buy and streaming links. How did you come to work with Noisia and Invisible on this EP? I released quite some tracks in the past on Invisible, but they were all single tracks on various artist EPs. Around a year ago Noisia asked me if I wanted to make a solo six-track EP for Invisible, and here we go! One of them was signed a bit longer, but I grabbed that one as a starting point of this EP. You’ve said that you feel this EP represents a new chapter in your production and you wanted to make it special. How did you set out to do that? When they asked me for the EP it was the same moment that I was switching DAWs (from Acid Pro to Cubase). In the past 18 months, I worked really hard to get used to Cubase and to learn new production methods, which were impossible in Acid Pro. Due to the DAW switch and the EP assignment I felt it was a totally new chapter for me production-wise. I kept pushing myself until I was totally happy with the tunes; from intro to outro. I prefer to work as long (as I need to) on a tune until I totally feel it, instead of working the same amount of time on four tunes which I think are okay. Also, before you send anything to Noisia, you think two or three times right? You also said you did a lot of new experimentation on this EP. Can you elaborate on what kinds of techniques you used or methods you were really keen to apply here? I’ve had many, many sessions with my Moog Minitaur, Serum, my Sherman Filterbank, many distortions and new plugins. Stuff I’ve never done before. I also recorded my own voice and made atmos(pheric) sounds from this. At the end I used 5% of all these sessions, but they should sound different than my older sounds. Puzzling with sounds is one of my biggest hobbies. Sometimes after a five-hour session it could still sound bad but I still had a good time. It’s giving me the same feeling as playing games when I was 18. It’s true that this EP has a very different feel to it than your other work and possibly than anything that’s happened in hard DnB in the last few years. How did you come up with these ideas to make it sound so different and new? I think it’s mainly because of the DAW switch. It was such a relief to work with a 64-bit DAW so I didn’t have to render tracks all the time as the reverb used too much CPU. Like I said, I worked hard to gain my technical skills, so that’s why I’ve released a little less tunes in the past twelve months than I have done in the years before. I haven’t watched any tutorial, I just wanted to figure it out all by myself. This way you have the biggest chance to create sounds, which have never been done before, in my opinion. I could also try to copy an artist I like, but you will sound like the artist you like, and most of the times not as good. What is the benefit of that? Creating my own vibe and sound is what I’m looking for, all the time. Was there an overarching concept or theme you had in mind for the EP other than it being a new chapter in your production career? I think my theme is always dark (laughs). When I finished five tracks and listened to them all together, I thought, “Wow, this is pretty dark. How is my mental health?” (Laughs) But yeah, I have a weakness for dark sounds. It’s the only sound style, which gives me the shivers, and I could listen to it for hours and hours which I have to when I make music. I’m all good, by the way. Don’t worry! There’s also a lot of variance from track to track. For example, “Crustacean” has a techstep vibe but is super clean, while “Reliever” is more darkstep and super groovy. Was it important for you to have each track really strong and different as a standalone? How did you see these tracks as going together on one EP? Is this EP representative of the direction you want to take your sound in the future, or can we expect even more surprises on future releases? I’ll definitely use the learned techniques in the future but I always want to learn and develop. The good thing about making music that you can always learn something. It never stops. I hope I keep getting these random rhythms and basslines in my head. As long as this is happening I’m fine. Anything else you’re working on at the moment? If so, is it really different from this EP? I’ve worked a lot with Amoss lately, but more about that at later date. I have two tunes with a talent named Ground coming up on Flexout, a collab with Signal and Disprove on Shogun, a collab with Subtension, a remix for Kyrist and I’ve finished a couple of new bits as well. Yep, I’ve been busy. I think all of these are totally different actually. Some are a bit more hypnotic, experimental, old school or more heavy. Heavy for me that is!